Bob at Bobby's Monster Models steps into the closet for a little glue sniffing, kit building, and hobby chat. What is it about building and painting model kits that's kept you a fan all these years? At the start, it was all about the beginning of my mid-life crisis. And it was about recuperating from a broken heart. I was 35 years-old. Then I had a couple more bad knocks set me back, and diving into monster models and toy collecting became my escape. I was finding pleasure in rediscovering things I had long since forgotten as a child. These models take me back to a time when things felt more secure, when I had no worries, when the world was right-side up and not upside-down. My hobby became cathartic. It turned into a tool for healing. And it worked! It became a physical obsession to distract me from other mental obsessions that weren't doing me any good. Now that I've made it through my "dark night", it's just become a passion that I truly enjoy. How did you learn to build and paint your model kits like a pro? When I first started, I knew what I wanted to achieve, but had no idea how to get there. I've been an artist, painting and drawing all my life. I knew if I applied that to these models, that hopefully, I'd pull off a decent kit. I painted my first monster model, since the early 1970's, in 1998. My first 4 or 5 models were my learning curve. I was using paper towels instead of brushes to achieve a dry brush look. It worked to some degree, but I wanted better. Todd McFarlane Productions was releasing fantastically detailed monster toys. I started scooping them all up. I began studying how they were painted. I started surfing for monster models like crazy on the web. Downloading tons of jpg's of painted up kits, studying the strengths and weaknesses of the paint jobs, the colors, the contrasts. What worked, what didn't. Figuring out how to make it better. I had gotten into enamels, which I used as a boy. Acrylics dry too fast. I liked taking my time. But with enamels you do wait a long time between base coats and several rounds of dry bushing. Another big help were the plastic model forums. I asked lots of questions about painting. I'd post pics of great paint jobs and pick everybody's brains about how they thought it was pulled off. Then I'd go back to my models and try lots of different techniques. I have found that the secret of a great looking monster model is the dry-brushing. And keep that brush dry! Your dry-brushing technique will make or break the model. If you can make your dry brush look like an air brush, then you're set. Or you could just buy an airbrush! One day I might get an airbrush, but for now, I'm digging the dry brush. Oh, and BTW, I don't do resin kits, just styrene. It's just a choice. Each kit is a challenge. I have no idea how I had the patience to build them as a child. And I've always been a perfectionist, so there's no room for slop or error. The littlest waiver in a painted line and I have to clean it up. I have really high standards when building and painting these things. To me, they are fine art, and I have always had to have an artistic outlet. I work in technical illustration/graphic arts by day, so this is something I do for fun, but I do take it seriously. P.S. - Lastly, I could never do a kit justice without my magnifying goggles. I have horrid vision! Do you have a favorite model kit? What makes it your favorite? That's a hard question to answer. I love all my models equally. They all have a special place in my heart. Hmmmm, if I had to pick one, it would be Sleepy Hollow. That was an awesome kit to build. I was very happy with the way the horse, the base, and Tim Burton's severed head turned out. It's a really creepy model, and it's huge! My runner up would be the Munsters Living Room. Another huge kit, with 4 figures! I like the big diorama-style kits, because not only do you have a monster, but you have his environment, too. 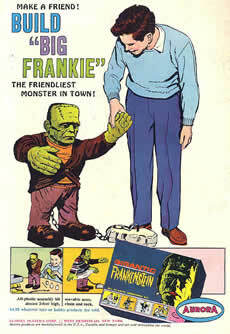 Tell us about your monsterkid years growing up. At night, when I was young, whenever a scary movie/show came on TV, my parents would tell me "It's time to go to bed". They'd give each other that knowing look, "If we don't turn this program off, we will never get him to go to bed." I was one of those kids that was put to bed and would keep calling my Mom to come to my room, "I'm scared", and she would ask what I was afraid of, and I could never really pinpoint exactly what was scaring me. I think it was all the snapshots I took in my mind of the tiny glimpses of horror that I was privy to see on TV. I was attracted to the whole genre like a magnet because it was forbidden. And at a young age, if I was told NOT to do something, I instinctively wanted to do it. Around 6 years-old I was allowed to watch the classics (Frankenstein, Dracula, Creature), we would hang in my basement on Saturday afternoons (lights out/blankets over the windows). When Halloween rolled around, I always had to be a monster, a devil, a grim reaper, or a ghoul. Around 1970, at 7 years-old, I got into building Aurora monster models. My Mom had taken me over to visit one of her friends, and this woman's son, several years older than me, had monster models sitting around his bedroom, and I was in complete awe. They were scary and I wanted them badly. I wanted to know where he got them, and how I could obtain them. I built a bunch of them. Eventually, the monster models faded. I blew them up, lit them on fire, and shot them with my BB-gun. You'll have to excuse me while I wipe the tear from my eye.............okay, that's better. So, from there it was horror movies through my teens, and then the inevitable reality...adulthood. Us monsterkids and toy fans know how difficult it is for family and friends to truly understand our mania. How do you handle the looks and the knowing nods? Screw 'em. Politely, of course. That's my philosophy. It's funny, I've hung out on lots of toy forums, and this question comes up often. I've read about people whose wives/husbands think it's weird they collect monster toys; guys who were asked to part with their collections; guys who were told they needed to "grow up". That's sad. I love my hobby! I've never been ashamed of it. I'm sure there are people out there who think "eww, how creepy", but to me it's more like, "here's an adult that can still connect with the kid inside". And that's a great thing, because there are alot of adults out there who do not know how to have fun. I believe our bodies are nothing more than vessels for our souls. Just because the body ages, doesn't mean the being itself has to vanquish youthful interests. Childlike innocence is what keeps our hearts pure. Am I going off topic? Where were we? Oh yeah, my family and friends think it's a very cool hobby. When they step into my toy asylum, they are usually overwhelmed and quite amazed. So much to look at. It's sensory overload! People are starting to tell me I need to open a toy store. It's that bad (or is it good??) Usually, the folks that find it "strange" are folks that have "folksy" hobbies, more puritanical views, or they just plain out cannot deal with horror movies (the freak-out factor). Another interesting thing is when I'm at check out in a toy store, they always ask me if I want a gift receipt. They just assume because I'm an adult, that the toy could not possibly be for me, and I always say, "Nope. This toy's for me." And they always smile...and I smile back. I have never been a conformist. I've always marched to the beat of my own drum. I've been single for a number of years now, and the last time one of my sister's saw my toyroom, her comment was, "We really need to find you someone." I laughed. When you have an "extreme" hobby you can't always expect compliments. Bah! When I'm old and gray, I plan on being a very eccentric toy collector. I just hope I can find someone that will carry the torch, and cherish what I spent a lifetime collecting. You obviously believe in the dictum, He Who Dies With the Most Toys Wins. What do you like to collect? I'm all over the place with my toy collection. Some things I buy for investment and some things I buy for me. When I first got into it, my goal was to try and track down all my old toys that got thrown out growing up (Major Matt Mason, Marx miniature playsets, toys and games like Green Ghost, Kabala, Battling Tops, Fang Bang, Ants in the Pants, Spirograph, etc). Ebay loved me and I was addicted. For awhile there I literally had a package in front of my door almost every night when I got home. It was like Christmas 365 days a year. It got very expensive. Eventually, I got to the point where I had to pick a genre, and since I had fallen in love with the old Aurora monsters again, I naturally picked monsters. So now, I mainly collect monsters. Recently, I picked up the new Mego-style Frankenstein and Wolfman from Diamond, and I also recently obtained the Gremlin and Kanamit "Twilight Zone" figures from Bif Bang Pow! And I'm always up for any truly weird/odd/creepy/strange toy...I love my Zombie Hamster. My 80 year-old Dad bought me the new Exorcist boxset from NECA, and an Elvira figure this past Christmas. I must admit though, I still have a weakness for some non-monster toys. Four Horsemen just reinvented the Outer Spacemen from the 1960's - I had to have them. I inventoried my collection in January, on an Excel spreadsheet, and found I am the proud parent of over 1500 toys, figures, games and accouterments. 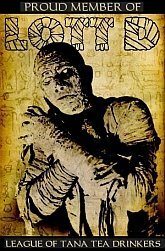 What influenced you to showcase your monstrous hobby at Bobby's Monster Models? Back in 2000, I was working for a small ad agency, on the print side of the business. We had hit a slow period during summer and I asked my boss if he'd mind me trying my hand at web. He let me build my first monster model site. I had a younger guy sitting next to me that helped me set up my page templates. The site was very dark, like the one I have now, but it had a more "glow-in-the-dark-haunted-fun-house" feel to it. It was pretty neat for my first site. I had sound bites buried in all the pages of lines from famous horror flicks. I left there in 2001 for a job drawing in 3D, completely forgot how to run the web software (Dreamweaver), and couldn't find anyone to update my site. In 2005, I got laid off from the 3D job, and needed to find work. Every prospective employer wanted someone with web experience and I needed to get my portfolio on the web for quick review by a future boss. I ended up taking a college night class in Dreamweaver, on building websites. I did well, and after getting my portfolio up (and landing a new job) I decided it was time to do a brand new monster model site. I was proud of the kits and wanted to show them to the world again. I put my current site up in 2008. The site is growing and slightly morphing in how I handle the individual model pages. I just started using "Lightbox", so it's going to be alot easier to add lots more photos now instead of just a few, or even just one. The new Dr. Deadly page is an example. No more thumbnails. My site isn't constantly updated. It all depends when I feel like building. I took this past winter off. I like to spray my base coats out in the hot sun. I do plan on adding assorted, related monster pages to the site over time. You'll have to dig for stuff though, like my Exorcist page, which makes surfing into a site fun. Recently, I moved, so I am getting ready to add another Toy Asylum page to showcase the new toy set-up. That's coming soon. And I have a new kit in the works...just waiting for the warm weather to kick in so I can spray paint outside. Here's the rundown from collectiondx. "EMCE toys is promoting a new kit they cooked up. 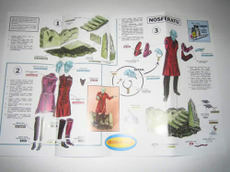 The "Make Your Own Zombie" Action Figure Customizing Kit. This thing is seriously cool! For $49.99 here is what you get..."
5 HEADS: Ranging from "just bitten" to just plain "yeech", with ultra-detailed levels of decay. 2 PAIR FOREARMS: One pair contains fresh wounds, and the second shows long-term decay. 2 PAIR LOWER LEG: Each pair matches the forearms' levels of injury and decrepitude, with torn flesh, exposed bone and withered skin. 2 PAIR HANDS: Also matching arm and leg sets for injury and decay, including exposed bones! 1 PAIR FEET: Rotten and chewed, with exposed bones. 1 CHEST "PROSTHETIC": Decayed skin pulled over exposed ribs and gore! 2 CLOTHING SETS: One complete business suit and one set of scrubs, lab coat and shoes. 1 1/9 SCALE BODY: With removable joints to add any of the above custom pieces. There's something special about this model kit. Hard to pin down, but maybe it's the skull locked in a never-ending scream, or maybe how the tattered clothes reveal the rat-picked bones underneath. It's shades of The Cask of Amontillado and hints of The Count of Monte Cristo. Harmless Fun? Sure, it's only plastic. Cheap thrills? For only 98¢ it was a bargain. Just flick a switch and down the blade came to lob off the victim's head, again and again. Did it start a chorus of angry parents chanting "off with Aurora's head!" Sadly, yes. Any idiot who thought whacking off tiny plastic heads from tiny plastic bodies could lead to moral decay obviously missed the point entirely: it was simply "a wonderful ornament for your desk or tabletop." Now, what would make it truly sickening would be to put in a sound chip so the victim pleads for his life, then WHACK! !, add a nice splatty sound cutting of his screams, ending in a plop and swish-roll into the basket for a grand finale. Wait a mo', what am I saying? That would be fantastic! Screw the glow parts in the reissue. Hell, if they can sell those tasteless miniature toilets with their flushing sounds, I can't see why not. Moebius, you listening? Madame Tussaud's Chamber of Horrors Guillotine made monsterkids deliriously happy and their parents delirious. The uproar put a halt to Aurora's other potential entries in the series: the Electric Chair, the Rack, and the Hanging Tree. 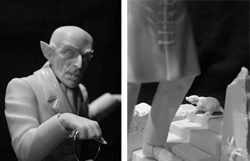 Standing around 3 inches tall, these Universal Monster figures are darn cute. These came in black and white and color versions. There is nothing like the smell of styrene in the morning. 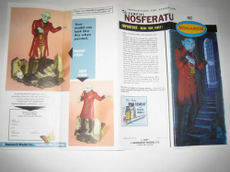 Monarch's Nosferatu hits the shelves in time for the monsterkid gift-giving season--hint, hint. So stop drooling and buy one already. And don't forget to mail in the club membership. Click each image to get the big picture. A new monster model kit maker is prowling the block! Picking up the legendary Aurora styrene kit-making torch, Monarch Models plans on bringing horror nostalgia and classic monsters back to rampage among the boring shelves of snap-together car, plane, and Star Wars vehicle kits. 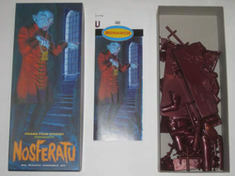 Their first offering will be Nosferatu, a one-eight scale kit, packaged in the beautiful box-art and wrapping that Aurora fans know so well. I can smell that glue now! Scott Mckillop of London, Ontario, the founding father of Monarch Models, dropped by for a brief chat. To give modelers like myself a choice beyond the ordinary cars and armour. What makes you want to rekindle the legendary Aurora model kit mystique? Aurora made modeling fun for me as a kid, and I miss that in the hobby today. Polar Lights did a great thing when they were here but with their disappearance, we are back to square one. The design of your website is very retro. Who came up with the concept? Your logo follows the original striking image of Aurora, but how did the Monarch butterfly image come about? Ahh, sort of by serendipity. It was a nice tie in to the Monarch name (Monarch Butterfly) and to lend a continuity to the Playing Mantis praying mantis mascot. Mostly I liked the whole innocent presentation of the icon for a toy industry. I plain ol' like the look. Who are the creative people behind Monarch? Me, Gary Makatura, Jeff Yagher. That Nosferatu box cover art has old Aurora fans drooling. It's very reminiscent of James Bama's work. What other model kits are you planning? Come on, spill the beans! Well the next couple of kits are public domain. And that's fine with me because for one, it's free, and two, my favorite kits were always the public domain stuff like the Forgotten Prisoner, Dinosaurs, the Witch. But we are in the process of creating the next two kits and until the tooling is ready to go, I have to play it close to the vest. I will say this; the next kit is monster related to fit in nicely with the original aurora monsters. And the third kit is for the Sci-Fi figure guys. Both releases will occur simultaneously and in the next 8 months. These will be all new original kits, never seen in styrene before and likely never again because like all things we do at Monarch, these are limited runs. Licensed properties are next but probably not until 2008. Maybe sooner, it's hard to know with these things. Where can we find Monarch model kits? And when will you launch the first one, Nosferatu? So far Stevens International has stepped up to the plate as the largest world wide distributor, and they reach pretty much everyone. But no dealer will go away empty handed. But they still need to contact me; the crystal ball cracked a few years ago. I am planning on world wide distribution through the help of Stevens International beginning in June. What's the Monarch Fan Club all about? Free stuff! Well...for the nominal fee of two sawbucks! But believe me, this is a non profit club. It's just my way of rewarding the loyal model builders with cool gratis promo booty. Clubs were always the fun part of models and toys in the 60's and 70's. Think of the GI Joe club from way back when. Great stuff!